North Mid West Nepal Himalaya. Adventure within high and scenic Manang valley. Pisang Peak Climbing, an adventure on top of 6,091 m and 19,984 ft high peaks within high and scenic Manang valley located Northern massive range of Annapurna Himalaya and close to Damodar Himal on North Mid West Nepal Himalaya.a fabulous adventure with trek and Pisang Peak Climb following the scenic and famous Annapurna Circuit Trekking route most of the way to Jomsom town from Manang areas to Mustang region over a high Thorang -La pass. Pisang Peak Climb grade as PD + 'Per Difficult' which is used from French / Swiss Alpine Climbing Classification for this type of climb of few days, which leads you to rocky areas of the moraine, ice and snow with glacier walking. 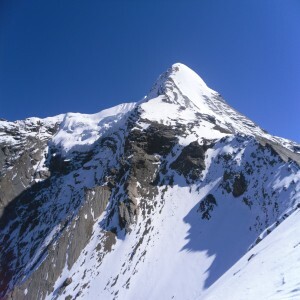 Pisang Peak Climbing is the most popular Peak among the trekking peaks in the Annapurna region. 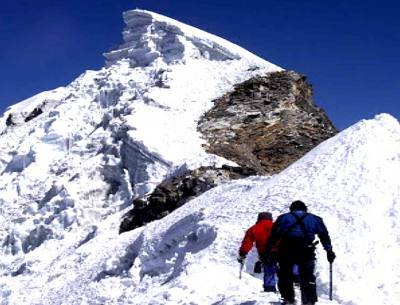 Pisang Peak climbing an adventure climb on top stunning peaks above high-beautiful Manang valley it is on the way to the highest pass of the world and offers good scope for exploration. A full supported climb backed by our expert guides that leads on top and safely back with pleasing and enjoyable time before and after the Pisang Peak Climb with fantastic views that surrounds you on daily walks. the walk leads after an exciting drive from Kathmandu to reach Mid West Nepal around the low warm valley and then heading into hills covered within alpine cool woodland past lovely villages of Jagat-Dharapani and Pisang, where tree lines disappear on leaving Pisang village into the wilderness of mountains. Camping is organized for few nights on Pisang Peak Climb at base camp and on High / Advance Camp to make the climb more easier and accessible, with the full support of our guide climbing on stunning Pisang Peak top, rewarded with the breath-taking scenery of mountain views-valley and hills. after our marvelous climb heading towards Manang valley and over high and scenic Thorang-la pass of above 5,416 m pass leading into Mustang areas at holy Muktinath Temple and then down at Kaligandaki River at Jomsom for the scenic-short flight to beautiful Pokhara. 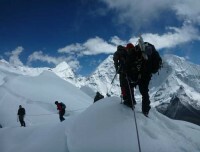 An adventure climb on top of stunning peaks above high-beautiful Manang valley. Rolling green hills with white snow-capped peaks. Daily walks Traditional hill and mountain villages. Highest altitude On top Pisang Peak at 6,091 m / 19,984 ft high. 1Arrive in Kathmandu via respective airlines and transfer to hotel. On arrival at Kathmandu international airport, you will be well received by Reasonable Treks & Tour staff and guide and then transfer you to your hotels within the hub of Kathmandu city around the most happening and exciting place around Thamel. 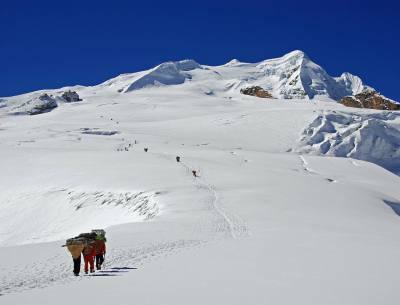 The evening after checking into your rooms with refreshment our guides will brief regarding Pisang Peak Climb with welcome dinner in a nice authentic Nepalese restaurant with culture show. 3Drive to Syange 1,140m via Besisar - 06 hrs.Starting early with an overland drive towards the foothills of Annapurna and Lamjung Himal with an interesting overland drive towards Nepal mid west, as the drive reaches at Besisar town (headquarter of Lamjung district). from here getting into another vehicle and then continue drive past Khudi, Bhulbhule and Ngadi villages following Marysangdi River upstream. Drive continues through rice terraces fields and villages to Syange a small village for overnight stop in the comfort of nice lodge. 5Trek to Chame 2,720m - 05 hrs.From Dharapani walking into cooler areas within rhododendron and pine forest past Bagarchap and Danque then at Timang village where you can find more Buddhist cultured village including views of Mt. 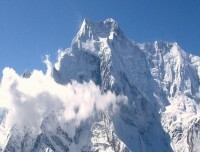 Manaslu 8,163m / 26,781ft. from this scenic Timang village few hours trek leads to Koto and then to Chame town for overnight stop, Chame a large major town of Manang area and a head quarter town of the district. 6 Trek to Pisang 3,190 m - 05 hrs.Pisang village onwards leads you close to mountains as the walk proceeds into serene alpine forests of rhododendron and pine trees, following Marshyangdi River upstream with short ups and down hills to reach at Bhratang village. from Bhratang village walk follows uphill through alpine woodland overlooking Chulu’s and Pisang peak, with possible lunch stop, and then descends to lower Pisang village for overnight stop. 7Acclimatization day at Pisang with short hikesA necessary rest day at Pisang around scenic Manang valley for acclimatization before reaching higher areas and climb of Pisang Peak, in Pisang village short hike around high villages, situated on windswept valley by the bank of Marshyangdi River below Annapurna and Gangapurna mountain range, a nice walk uphill for views of Gangapurna Glacier. 8Trek to Pisang Peak Base Camp 4,380m - 04 hrs.After a nice and pleasant rest day at Pisang village, our actual adventure starts heading north above Pisang village, as the tree lines drops for short few bushes around grazing land, called Kharka. Climb a high ridge above Pisang peak, our guide and staff will set base camp with camping equipments at 4,380 meters high, first night in tents meals prepared by our expert cook and kitchen staff. 9Trek and climb to High Camp 5,400 m - 03 hrsA short day but tough due to high altitude, morning walk follows a faint trail where few climbers and Yak herders hardly use this path to high camp, as the walk leads over rocks, ice and glacier to reach bottom of Pisang Peak where high camp is set for the climb. afternoon our guide will scout the area for safe accessible route to the summit fixing ropes and making ice ledges where necessary, High Camp situated on long ridge of Pisang Peak, under some conditions this area may be under snow, afternoon free to sort the gear with preparation for the early morning climb. 11Trek to Manang 3,540 m - 05 hrs.Morning views of mountains, from here onward altitude gains as the walk leads through forest with short uphill and views of Annapurna II and III, Gangapurna Chulu’s and Pisang peak. 12Trek to Yak Kharka 4,210 m - 04 hrs.After Manang, walk towards Ghunsang village with short uphill to reach at Yak Kharka, an interesting walk with views of snowcapped mountains, on crossing a small stream reaching Yak Kharka for overnight stop, a small settlement with views of Gangapurna, Annapurna III and Chulu Peaks. 13Trek to Thorang- La High Camp or Phedi 4,450 m - 04 hrs.Morning starts with gentle uphill walks and getting closer towards Thorang-la after crossing a bridge with a climb along the river bank of Jarjung, finally walk leads at Thorang Phedi, here depending upon the physical conditions of the clients, if all goes well an hour steep climb to Thorang High Camp for overnight stop. 14Trek over Thorang La 5,416m | 17,769 ft to Muktinath 3,800 m - 06 hrs.Our highlight of the adventure having early breakfast walk leads to a long climb reaching at the top of Thorang-la Pass at 5,416 m / 17,700 ft. The highest point of the adventure with views of snowcapped peaks, and then with long descends to reach at holy Muktinath around Lower Mustang area. On reaching Muktinath for overnight stop, this is a holy spot for both Hindus and Buddhists the word Muktinath literally means ‘the place for Nirvana or Liberation’. 15Trek to Jomsom 2, 715 m - 04 hours.From Muktinath, rest of the walks is easier with big drop of 1,200m as the trail descend to Kaligandaki river valley to reach at Jomsom, headquarter town of Mustang region with a small airstrip above Kaligandaki River, an interesting country walking on Kaligandaki River valley within dry and arid country with incredible views of windblown hills and canyons. A pleasant walk of few hours brings you at large town in Jomsom the capital of Thakali people of Tibetan Buddhism sects. At Jomsom for overnight stop headquarter town of Mustang district with nice paved streets and many well kept lodges. This Kaligandaki area famous for delicious apples and its products, here celebrate with local apple products cider, brandy and juices. 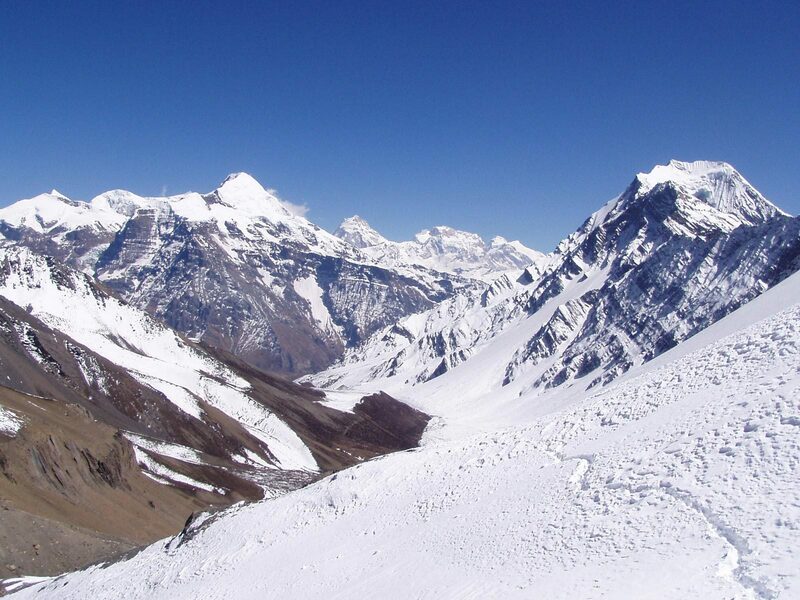 Kaligandaki area is also famously known as Apple Pie Trail. 16Fly to Pokhara and transfer to hotel. Morning short walk to Jomsom small airport for short scenic flight to picturesque Pokhara valley, Pokhara with massive Annapurna Mountain views with serene Phewa Lake where our hotels located, afternoon free for individual activities and souvenir shopping or just relax and enjoy the views. 18International Departure for Homeward bound.As per your international flight time transfer towards Tribhuvan International Airport for the journey back home or to respective destinations after a super and amazing time in Nepal Himalaya on Pisang Peak Climb. We climbed Pisang Peak Climbing, With Reasonable Treks And Tour/Anil Dhungana provided we Very helpful and professional assistance in planning for Pisang Peak Climbing, he’s is Organization for 18 Days Pisang Peak Climbing, Mr. Anil He is Recommendation climbing Guide jangu Sherpa and porters were very friendly and they adapted the trip to our wishes. We take a lot of photo during climbing times We did it the Wonderful and amazing experience to reach the Top at Pisang Peak Climbing, Guide jangu he gives to everything information details on the way I Show village and mountain. Really enjoyed the climbing in Nepal, Thanks to our Guide Jangu Sherpa also porters, we want to highly recommend this company and staff for other travelers. Thank you so much, Mr. Anil, we really happy for your Trip. We will back Next Time! !